For churches governed by the EU General Date Protection Regulation, where consent is used as a legal basis for processing data, the right to object to processing doesn't apply (although an individual always has the right to object to processing for the purposes of direct marketing, whatever lawful basis applies); however data subjects can invoke their 'right to be forgotten'. 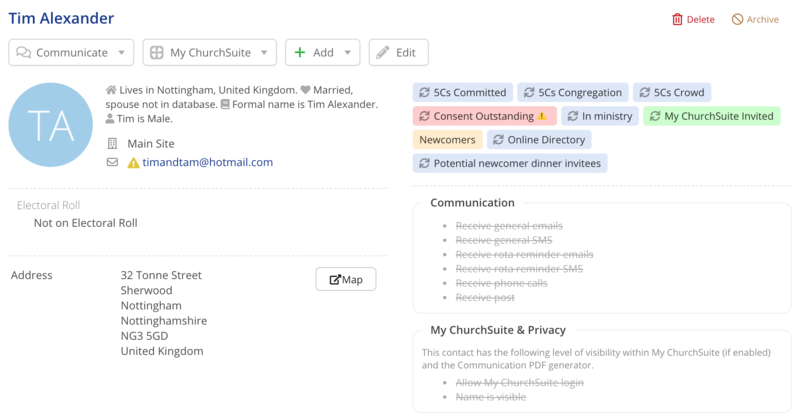 ChurchSuite no longer includes functionality for notifying "Forget me" requests. The "Forget me" functionality, first introduced for the GDPR, was deprecated in November 2018 and has been replaced with Delete account functionality, which is outlined in this support article. 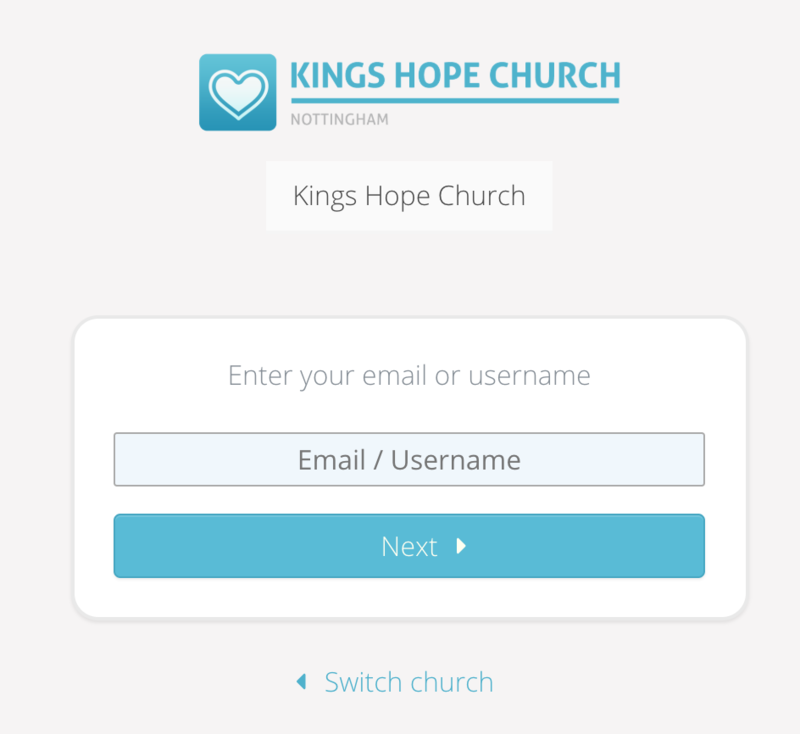 The scope of Delete account is a request by a data subject to be removed from your organisation's ChurchSuite account. No data is automatically deleted by a "Delete account" request. 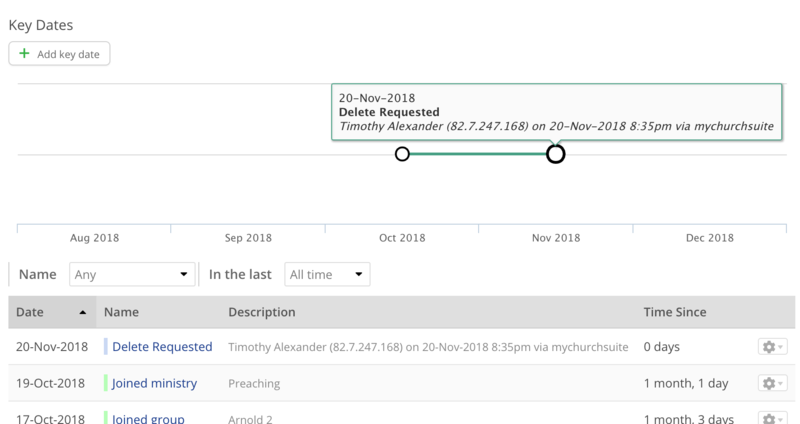 A "delete account" request is still notified to your designated Data Protection contact alerting you that a person has requested that their ChurchSuite data be deleted. It's then up to you, the data controller, to action that request as appropriate and confirm back to the data subject. Remember, you may have a lawful basis for continuing to process some or all of their information! 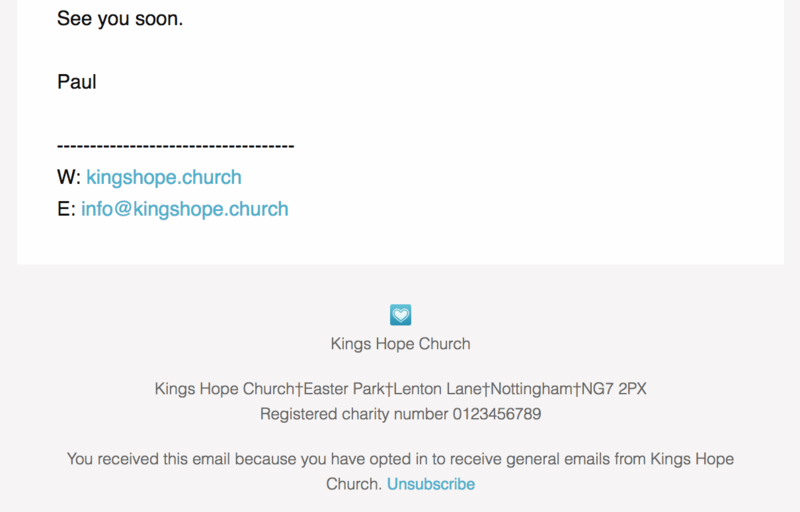 ...and on the Communication page linked through from the Unsubscribe link in the footer of certain emails sent from within ChurchSuite. When a person selects Delete account, a confirmation pop-up is displayed explaining what will happen if they proceed. 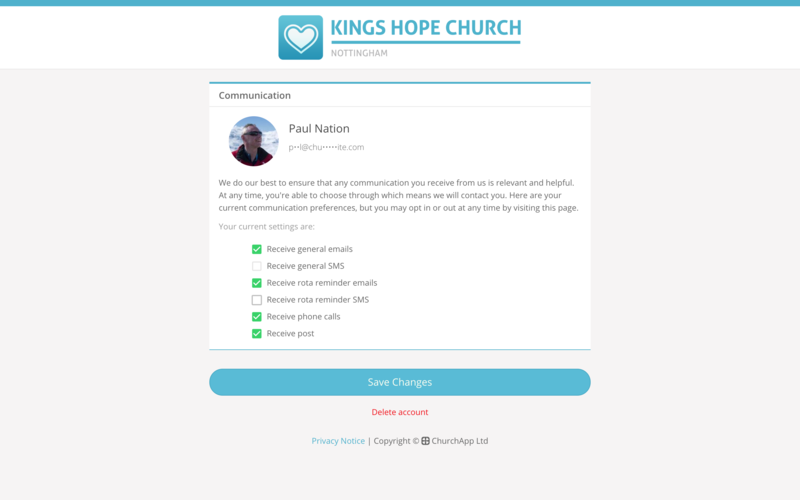 Additionally, all Privacy options and Communication options are opted out, preventing any of their details being visible to others in My ChurchSuite, and preventing them from receiving further email or SMS communications sent through ChurchSuite (unless a user, when sending, selects to not respect communication options - in which case an email will be sent). 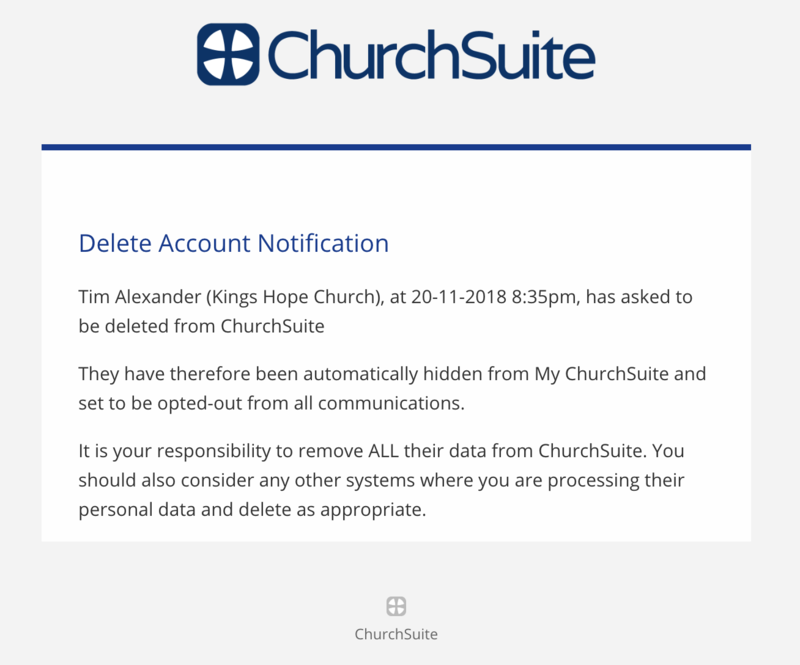 ...and a Notification email is sent by ChurchSuite to the church's designated Data Protection contact (set in Administrator > Profile), alerting them that a person has requested their account be deleted from ChurchSuite. 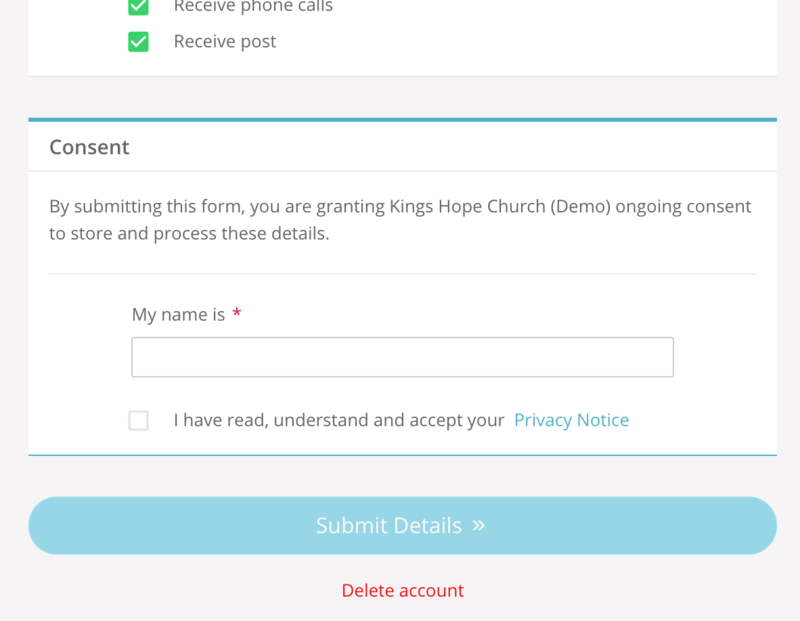 Your church can now follow your preferred pastoral and administrative workflows for removing personal data held on ChurchSuite, before confirming back to the data subject that their request has been actioned. Note: Delete account will never auto-delete a person. Delete account will also not auto-archive the person. All their data - event sign-ups, ministry and group membership, linked family members, etc remain in tact. Where an account deletion request has been received, you may still be able to rely on a lawful basis for continuing to process some or all of the information - for example, a legitimate interest may apply to things like membership lists such as the electoral roll - this will be determined by your privacy notice. Finally, all Data Protection contact notifications, such as 'delete account' requests, are listed in the Recent Activity > Communication log visible in the Administrator > Profile area.